Geniales CD-großes Boxset enthält Bild-CDs in Farbhüllen plus 38 Seiten Booklet - 80 Tracks - meist bisher unveröffentlicht! Hier habt Ihr alles!!! Boxset ist nicht mehr verschweißt, deshalb der günstige Preis... Mamamamamamamam 4 CDs ! Industry weasels have called us "insane" for even considering a 4-CD Trashmen box set. Of course, that very lack of foresight is what makes them weasels in the first place. You, our discerning friends, might concur on the "insanity" thing, but will also know instantly that this is indeed the Motherlode, possibly the very reason God put Sundazed on this fine earth, our legacy to the ages. Fifty years from now, direct electronic stimulation of the cortex will have obsoleted music as an entertainment medium. Your CD collection will seem as quaint to your grandchildren as those turn-of-the-century stereopticon viewers do today. Only three albums will make the transition to direct-feed brain candy: the Rolling Stones' Out Of Our Heads, the Beatles' Revolver, and Bird Call! 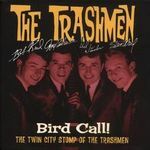 The Twin City Stomp Of The Trashmen. While those other two titles will be perpetually hailed as zeniths of attitude and craft, this 4-CD Trashmen collection will be cherished for embodying everything else loud, frantic and wonderfully stupid that is rock and roll. And, this runaway truck is crammed to capacity with crazed trackage, nearly 50% of which has never before been heard since the day it was recorded. Recorded 1962 to 1967, it's all here: studio material, demos, rehearsal recordings, live tracks, a massive 40-page book pumped fulla interviews, notes, memorabilia and unseen photos - a total assault on the senses...for the ages. We have seen the future, and it is us. Be remembered as someone ahead of your time, a tres-cool old buzzard. Immortality is now within your reach. Bird Call! The Twin City Stomp Of The Trashmen.. buy one for yourself, and one for each of your grandchildren.